King Felipe promised to be more present in Catalonia amid that region’s ongoing flirtation with independence. 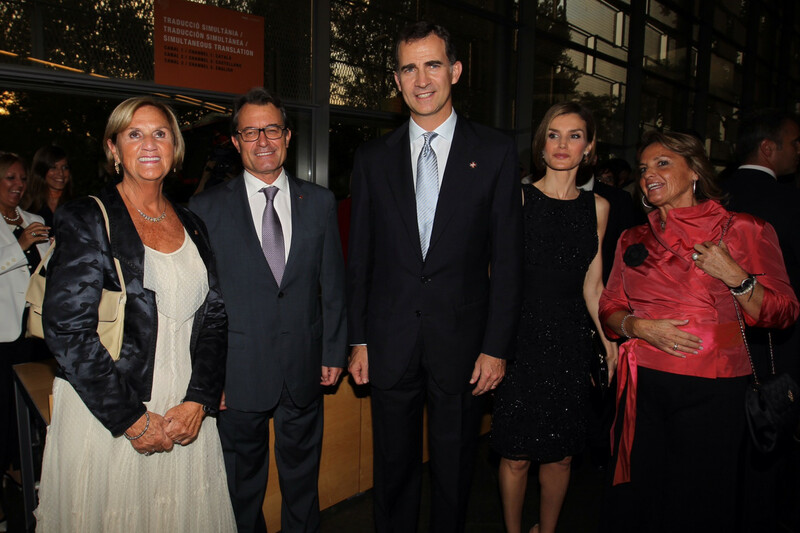 Today King Felipe and Queen Letizia attended the Prince of Girona Foundation awards ceremony in that Catalan community. 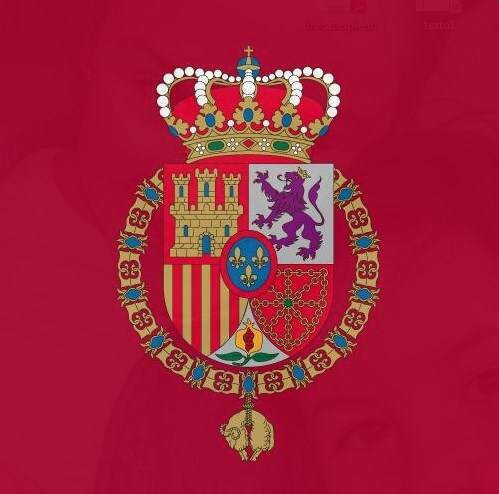 The King’s daughter, Princess Leonor is the current Princess of Asturias and of Girona. Queen Letizia appeared with a short hairdo today, but it appears to be the faux bob she’s worn before. 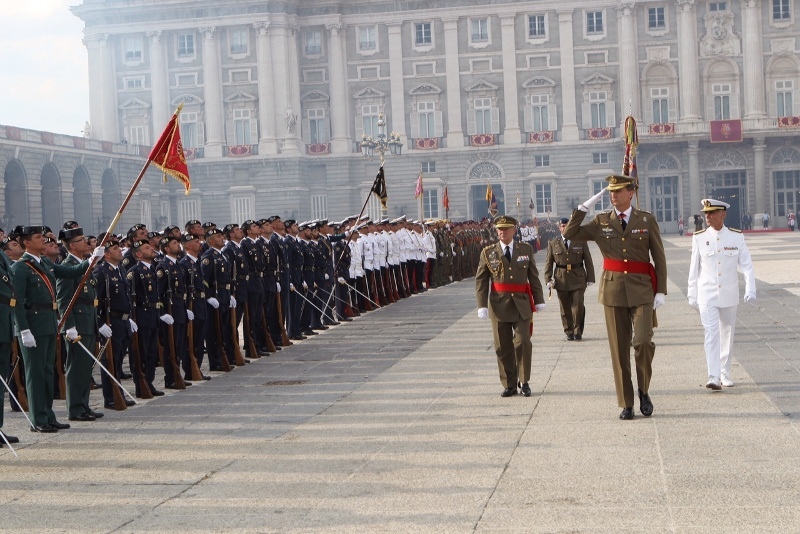 Separately, this week Spain’s armed forces saluted their new chief during a ceremony at the Royal Palace in Madrid. 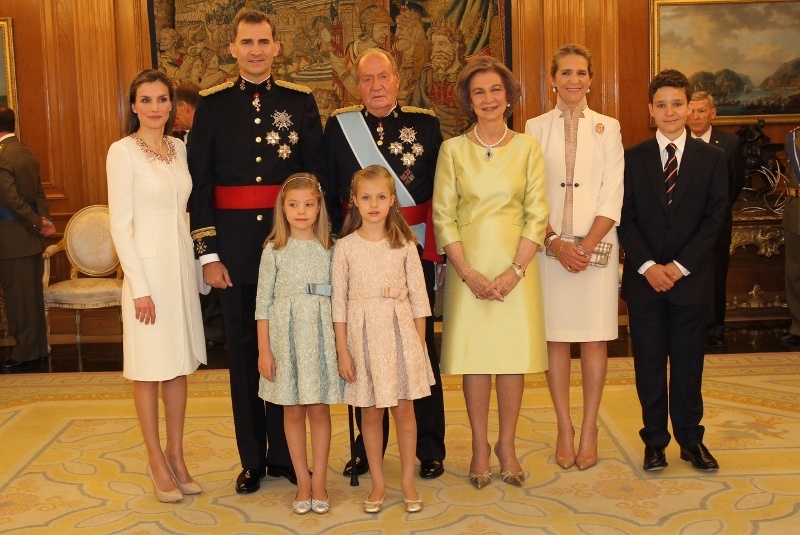 King Felipe has named Jaime Alfonsín Alfonso as Chief of the Royal Household, and is adding a diplomatic aide post. He is also making sure his parents, King Juan Carlos and Queen Sofia, keep some staff at their disposal. 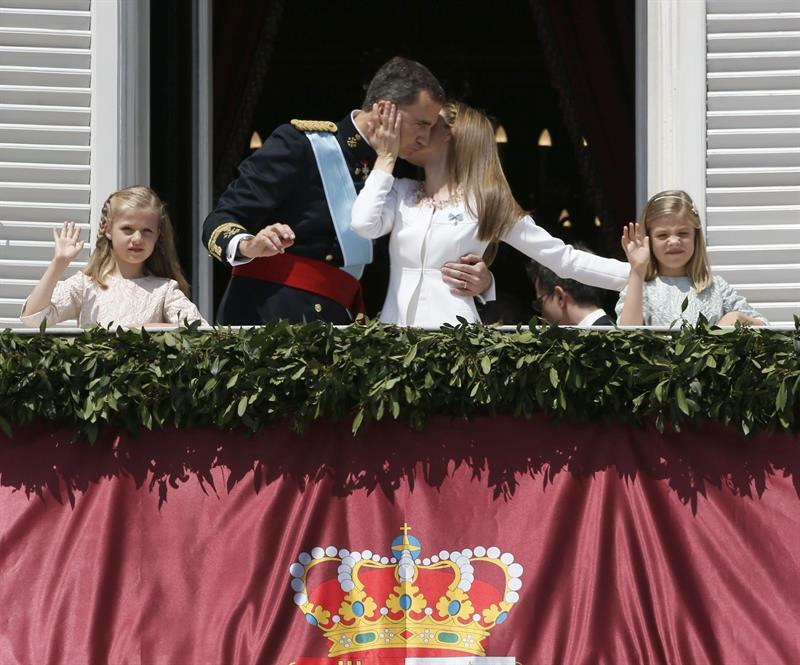 King Felipe’s efforts at restoring the Crown’s standing with the Spanish public came as a Balearic Islands judge decided to try his sister, Infanta Cristina, on corruption related charges connected with her husband’s business dealings. Prosecutors disagree with the judge and are continuing to fight his decision to include the Infanta in the proceedings. King Felipe began his reign last Friday, one day after his proclamation, with a meeting at Zarzuela Palace with Prime Minister Mariano Rajoy. 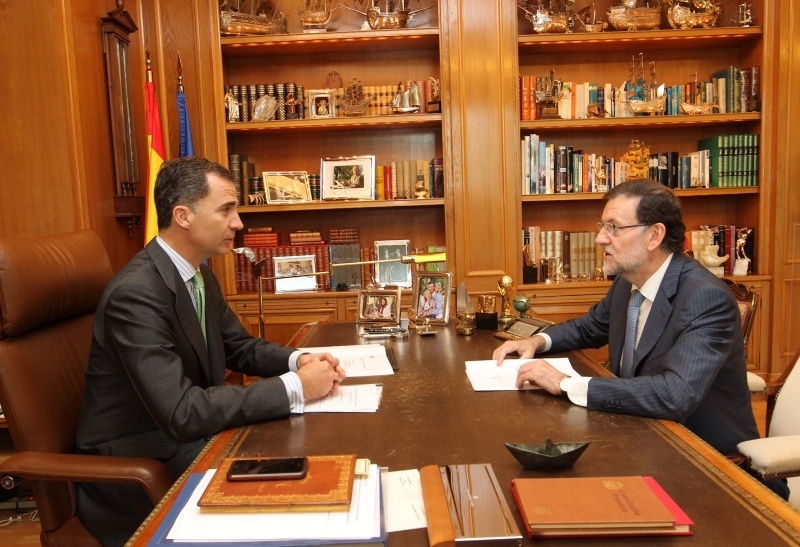 Regular meetings between the Monarch and the head of government are a common part of Spanish political life. He then presided over a gathering to honor victims of terrorism. 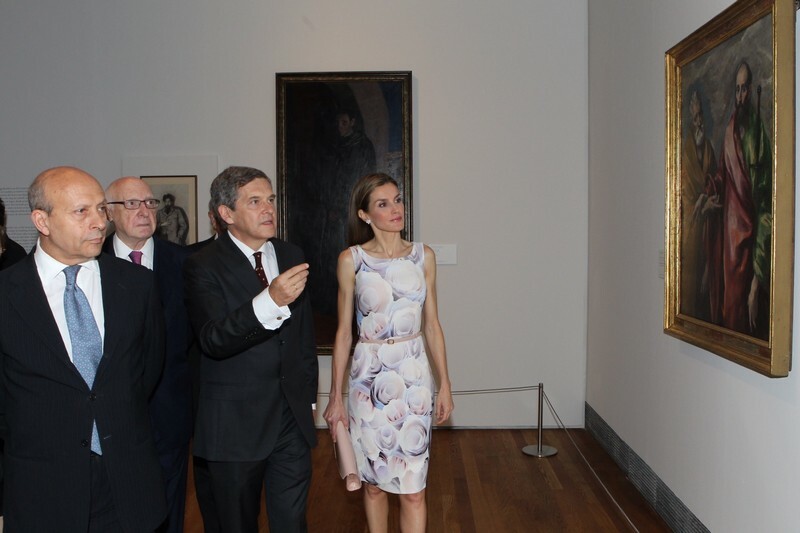 Yesterday Queen Letizia attended an exposition at El Prado Museum in Madrid. Their Majesties made the most news today when they met with numerous representatives of Spanish civil society groups, including gay rights organizations. Gathering at El Pardo Palace. 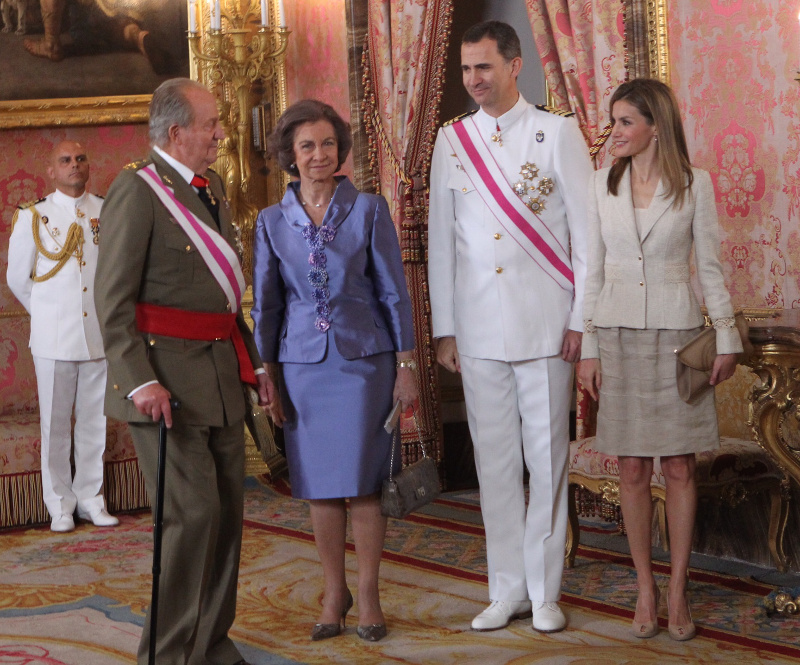 Media reports say it is the first meeting between Spanish Monarchs and gay rights advocates. The country is known as one of the world’s most liberal on the issue. Prince Felipe became King of Spain at midnight Spanish time. This morning, as planned, King Juan Carlos held a small ceremony at Zarzuela Palace to symbolically hand-over command of the armed forces. 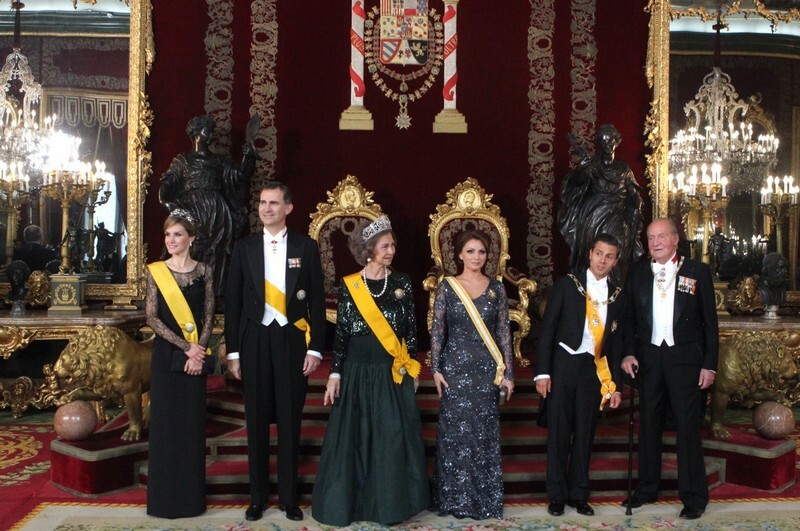 Infanta Elena and her son Felipe, far right, were part of the Zarzuela Palace ceremony. 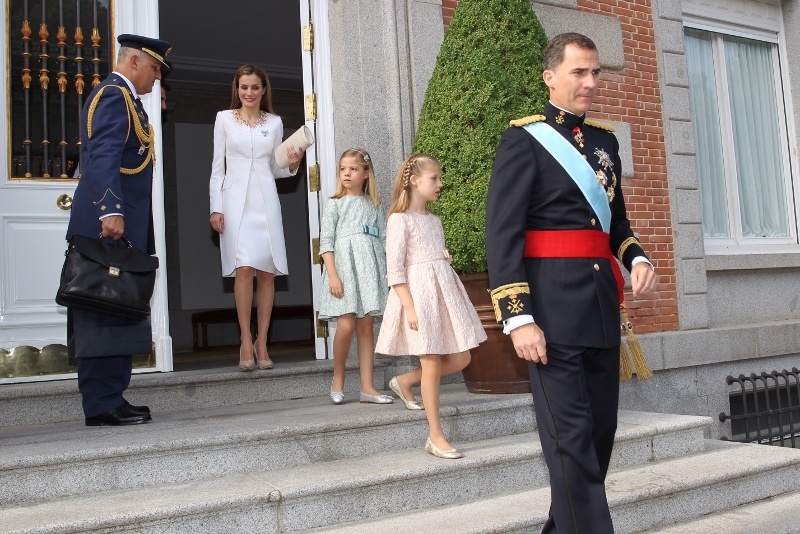 King Felipe VI and Queen Letizia, along with their young daughters Princess Leonor of Asturias and Infanta Sofia, then headed over to the Congress Palace. Also there were Queen Sofia, Infanta Elena and other members of the King’s Family. 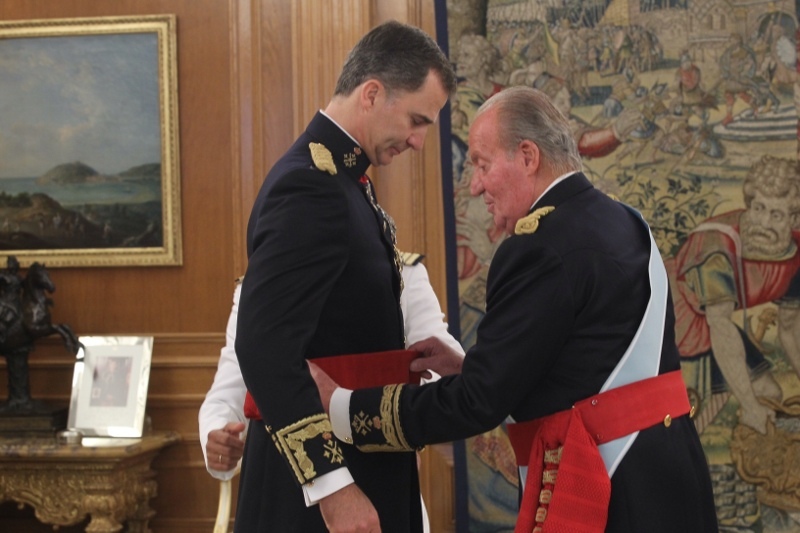 King Juan Carlos did not attend the proclamation to not overshadow his son. The King swore to uphold the Spanish constitution, spoke in favor of human rights and democracy, and offered a strong defense of the Monarchy. “The independence of the Crown, its political neutrality and its search for unity amid ideological differences, allow it to contribute to the stability of our political system,” the King said. The King also alluded to ongoing nationalist and separatist rumblings in certain communities. “Unity is not uniformity,” he said, in an effort to honor Spain’s diversity. “In a Spain that is united and diverse, based on the equality of all Spaniards, and the solidarity among its different communities and respect for the rule of law, we all fit,” said the new King. Don Felipe said improving Spain’s economic situation was paramount, and stressed the need for Spain to be a leader in promoting a strong and united Europe. King Felipe then proceeded in open car to the Madrid Royal Palace. Crowds gathered along the way. 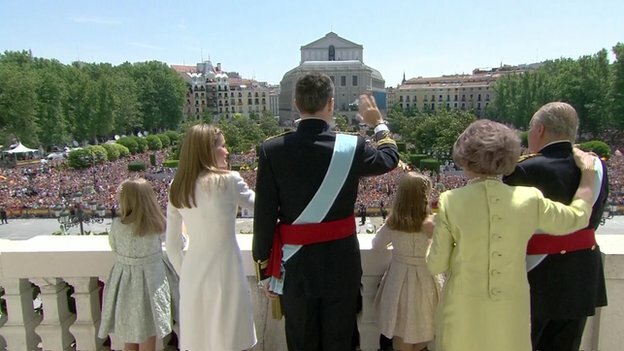 The new Royal Family greets crowds in Madrid’s Plaza de Oriente from the Royal Palace balcony. 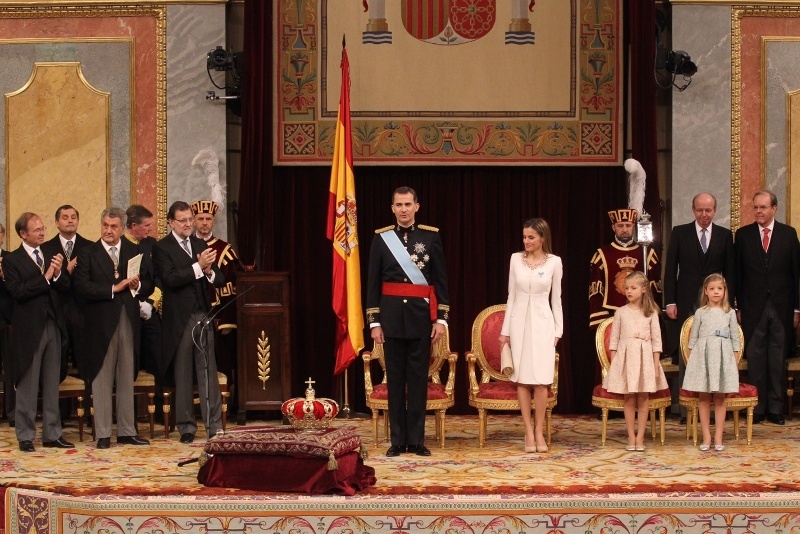 King Felipe and Queen Letizia were then scheduled to greet 2,000 guests at the Royal Palace. 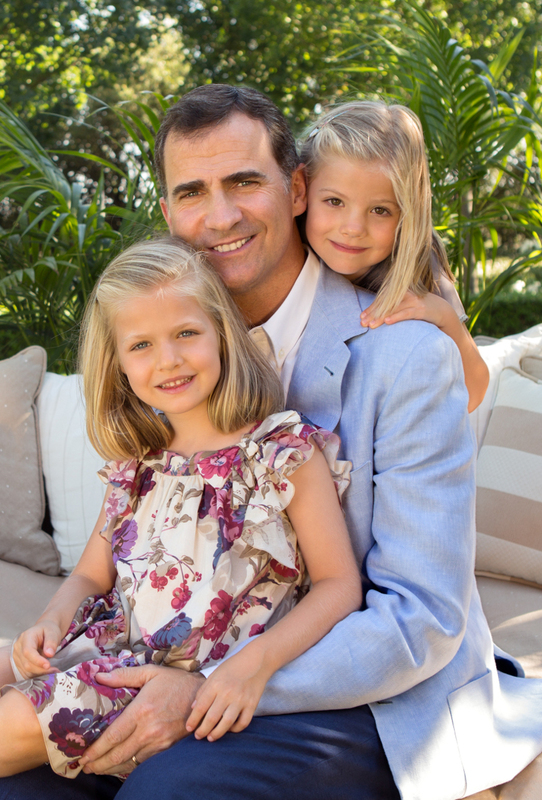 King Felipe, Queen Letizia, Princess Leonor and Infanta Sofia. U.S. President Barack Obama released a statement of congratulations this morning. “I look forward to working closely with King Felipe VI and continuing to strengthen this bond in the years to come. As Spain celebrates this transition and looks ahead to the future, the American people celebrate along with the people of Spain,” he said. King Felipe is adopting a Royal Standard slightly different from his father’s. It lacks the Cross of Burgundy and the background is maroon. Spain is on the verge of having a new King. 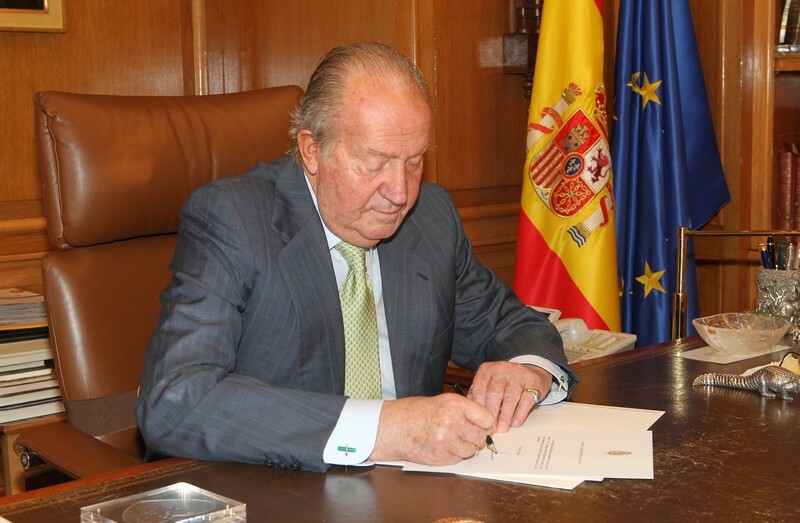 Today King Juan Carlos signed legislation to make his own abdication official effective at midnight Spanish time. 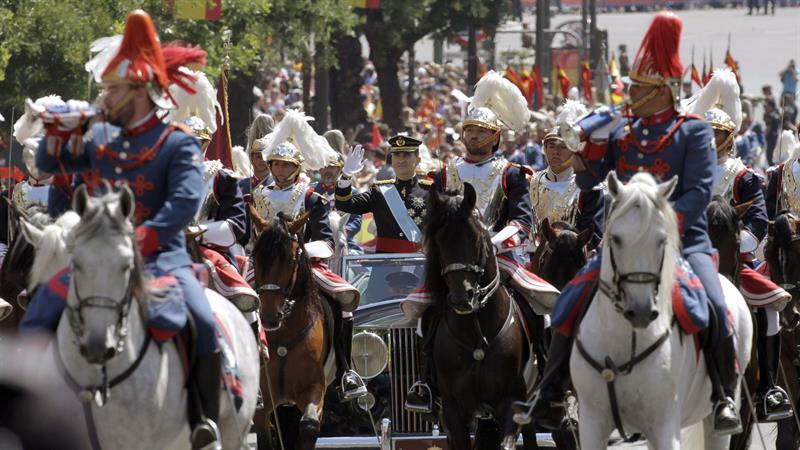 King Felipe VI will be Spain’s second head of state since the death of General Franco. 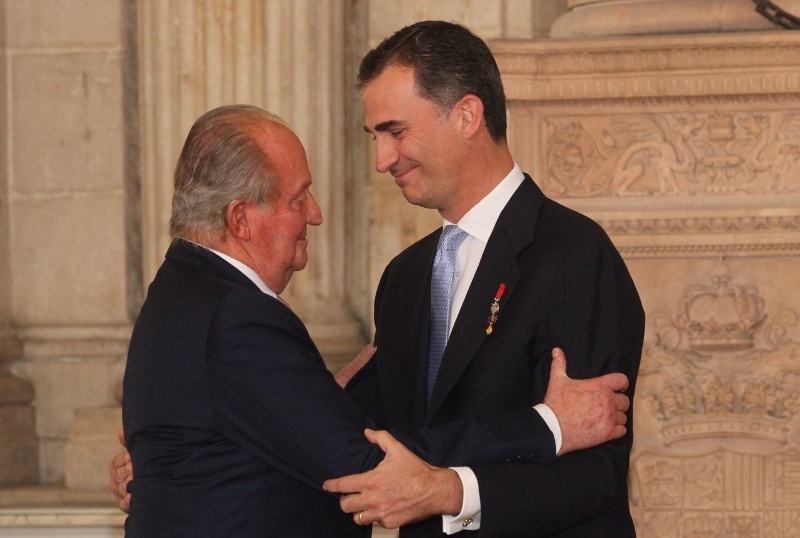 King Juan Carlos embraces Prince Felipe at the Royal Palace’s Hall of Columns during today’s ceremony. This is a historic moment for Spain. The country is seeing the first peaceful transfer of royal power in modern history. U.S. President Barack Obama over the weekend called King Juan Carlos to congratulate him on a “historic reign,” the White House said. Prince Felipe is scheduled to become King Felipe VI after proclamation ceremonies later this week. 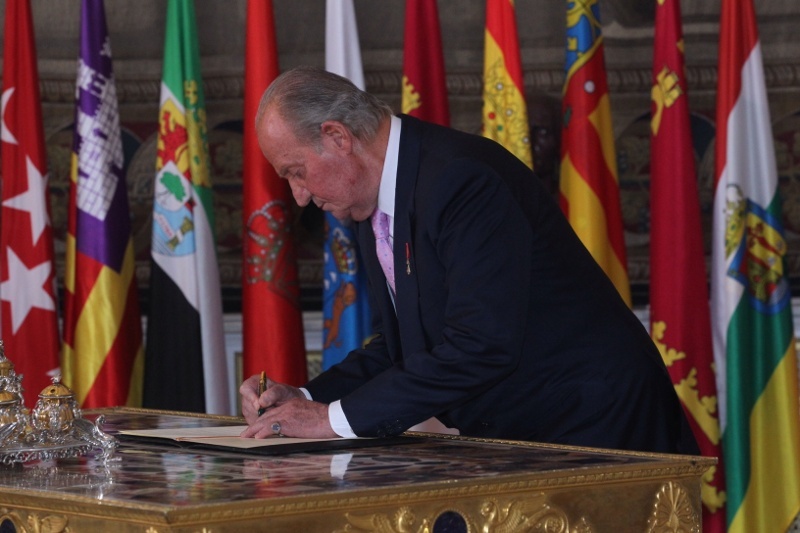 King Juan Carlos signing his abdication announcement after 39 years on the throne. The White House said President Obama thanked Don Juan Carlos for his promotion of democracy and transatlantic relations. Events to proclaim Felipe the new King of Spain will begin with legislative action in parliament on the 18th, according to media reports. 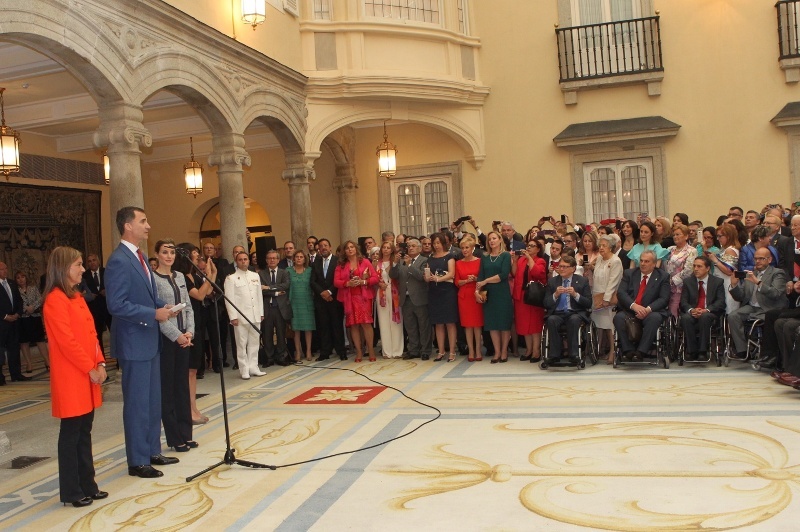 The 19th will see ceremonies at Zarzuela Palace, the Congress Palace and the Royal Palace, including a balcony appearance by the new monarchs. 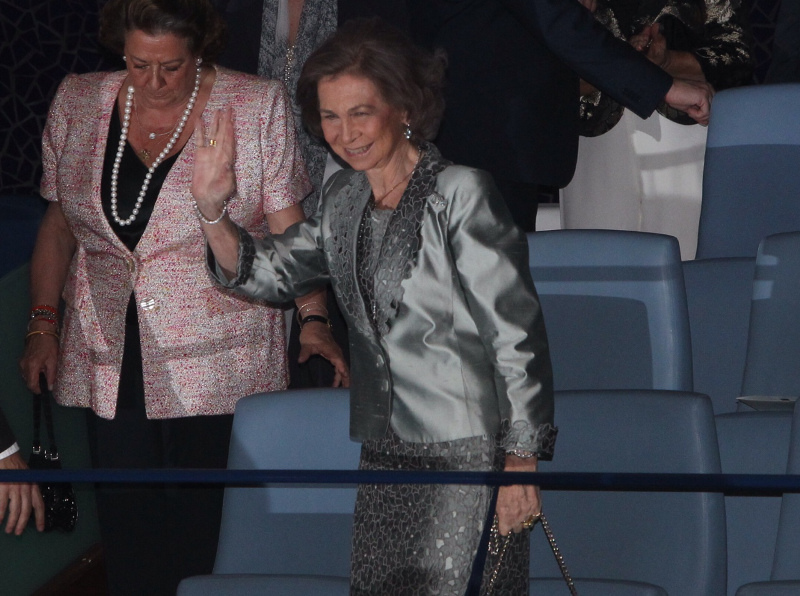 Queen Sofia at the opera in Valencia over the weekend. Spanish media outlets are reporting that security forces are beefing up their anti-terrorism stance in advance of King Felipe VI’s proclamation on June 19th. King Juan Carlos, Queen Sofia, Prince Felipe and Princess Letizia host Mexican President Enrique Peña Nieto and his wife for a state dinner at the Royal Palace in Madrid. As workers prepare the Congress of Deputies building for the event, security forces are mulling whether the new King should ride an open or closed car. It appears that Don Felipe wants an open top, especially on his ride from the Congress to the Royal Palace. Media outlets are also reporting that King Juan Carlos will not attend the proclamation to not upstage his son. Infanta Cristina and her husband, embroiled in a corruption scandal, will also not be attending. A majority of Spaniards supports a referendum on whether the country should remain a monarchy of become, once again, a republic, El País newspaper is reporting. 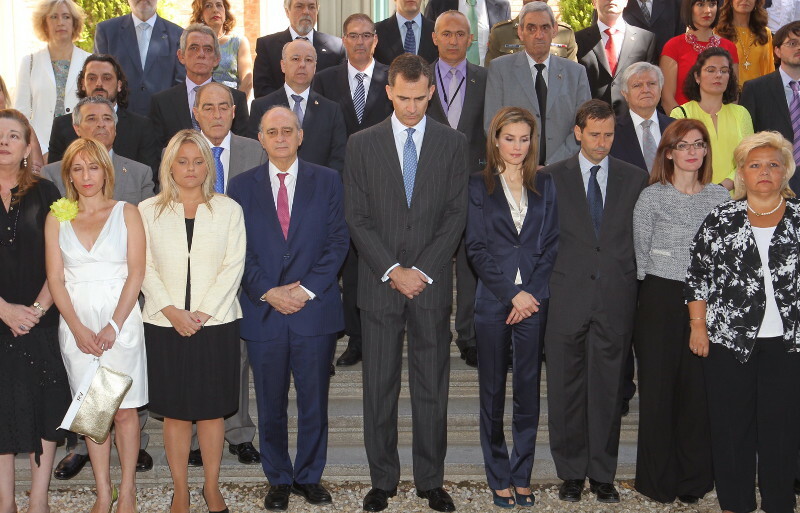 The news comes as Prince Felipe prepared to become King Felipe VI. The newspaper also found that while most Spaniards support King Juan Carlos’ abdication, only 36 percent want an elected president. 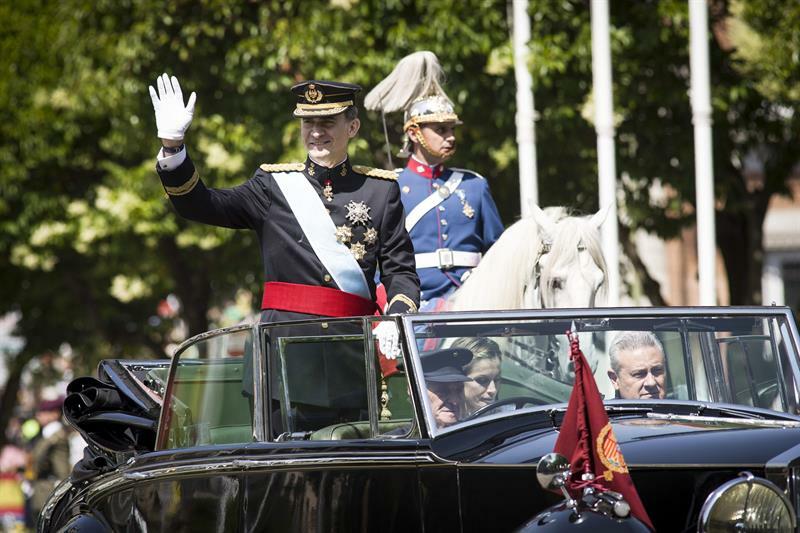 Roughly 50 percent of respondents expressed support for a Monarchy under Felipe VI. Support for the Monarchy is strongest among right-of-center voters. Socialists are divided, even though party leaders back the Monarchy. The newspaper’s president wrote that people’s desire for more democracy and transparency was not necessarily linked to whether the country had an elected or hereditary head of state. The military saluted the King today. Numerous Spanish leaders agree with the need to reform the Constitution to address political challenges, including separatist sentiments in Catalonia and the Basque Country. There is less elite support, however, for submitting the Crown to referendum.